Project KickStart - Plan to Act! Whether you're a novice or seasoned pro, you can start from a raw idea to creating a thoughtful, comprehensive task list and project schedule in less than 30 mins. Start your 2-week trial today! 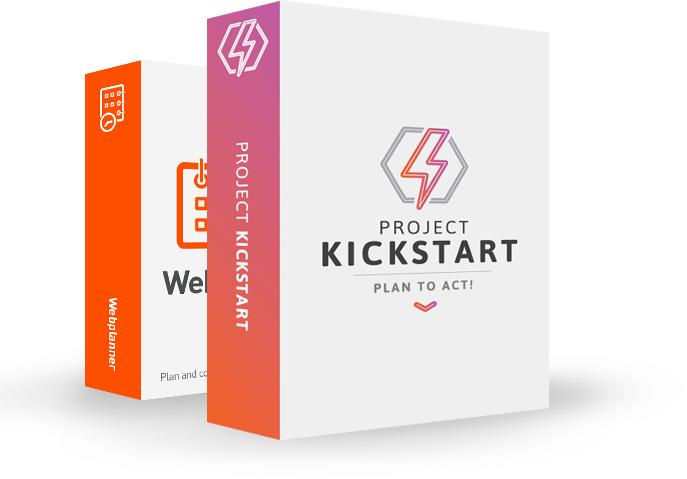 The first thing you'll discover when you try Project KickStart is that we start with the assumption you don't already have a fully formulated plan in your head. Quite the contrary, in fact, as Project KickStart helps you generate ideas by asking the right questions, giving guidance where needed, and allowing you to quickly create a smart, efficient, and organized plan, complete with phases, goals, obstacles and solutions. Get 3-months of Free Webplanner.com when you purchase Project KickStart 6, allowing you to publish your PKS files to the Cloud for easier collaboration with anyone, anywhere, on any platform. Click HERE to redeem. The new dashboard changes how you manage your projects, providing a quick overview of ALL your projects so you can preview your upcoming tasks, regardless of which project they're part of. Take your PKS project to the Cloud with Webplanner.com, and collaborate with anyone, anywhere, and on any platform or device because Webplanner works with PKS files. Protecting your projects has never been easier, as you can now backup all your projects, including attachments, in one password protected step that safeguards your work. Gantt charts now reflect the new Task features like Status & Priority, and includes auto task linking and dependencies, which previously was only included with Pro versions of PKS. Enjoy new features like Task Status & Priority, being able to clear as complete with a single click, auto-fit column width, column hiding, and improved task filtering. Save time by importing contacts from Act! as assignees and export tasks to Act! as activities to seamlessly integrate your workflow between these two powerful programs. The new comment logging feature within tasks was improved to be more intuitive and accountable, with new time/date/author stamps for each new comment or edit. Our new "PKS Updater" utility checks to see if you have the latest Project KickStart build, and updates your program in one simple step if a newer version is available. Keep the project on track with basic budget and cost tracking. Project KickStart v6 now displays a running "Total Cost" calculator at the top of the Task List, and at the bottom of the cost column. Preferences now support default directories for projects, templates, exported files, and attachments, as well as welcome screen options. Weve even enhanced attachment handling. Added flexibility in getting your contacts and resources into Project KickStart. The ability to import your coworkers, partners, or vendors from Act! or Outlook means less time entering them manually. Keep everyone notified about what and when things need to be done or any changes in schedule. Plan your activities in Project KickStart, and then "push" those tasks directly to Act! or Outlook. Project KickStart's Upgrade Assurance makes it easy and affordable to keep your software up to date, receive continued technical support, save money, and get free tier upgrades with Webplanner.com to help give your projects wings. Peace of mind with free minor updates for bug fixes and program improvements. Free tier upgrade to Webplanner subscription with Upgrade Assurance, a $60 value, is almost equal to the total cost of Upgrade Assurance. Cheaper than upgrade fees - automatic subscription renewal for a small annual fee (25%) means it costs less than upgrading every four years. No more worries about an outdated Project KickStart – Upgrade to future major version releases at no additional charge. Continued technical support via ticketing support. One Upgrade Assurance is required for each Project KickStart license owned. "When we come up with a new product that we need to work on and document for the FDA, Project KickStart is fantastic. It helps us figure out: How we pull the team together, Who needs to do what, What elements of the project are key"
A. Kay - Vice-President of Manufacturing, DynaMed Division, Gall's Inc.
"Project Kickstart is a great front end for all projects. I have been able to map out multiple projects for my team and have had no difficulty in convincing them of the relevance of each step." Project KickStart is a real confidence builder. You sit down with it, and in about 30 minutes, you can put together a very impressive project plan and schedule. Nobody believes it's that easy until they use Project KickStart for the first time. After that, they're converts. "All too often, though, we find ourselves overwhelmed by our impending tasks and cannot figure out WHERE to start. Project Kickstart makes this dreaded task a snap! By prompting me to identify obstacles, and offering the opportunity to assign people to tasks, it turns chaos into a plan." "Project Kickstart is perfect for brainstorming sessions. It's easy to use, and helps define goals, organize thoughts, and identify all the dependencies and sub-projects that you didn't realize existed until management and end user groups began their brain dumps."